Grinling Gibbons, How's that for a name that rolls off the tongue. One afternoon when we were driving back to base after a few days in that that patch of "gods own country", the English Lake District, Hilary (SWMBO) who was thumbing through a guide book, mentioned that there was a church coming up that had a Saxon cross in the graveyard. We made a detour and checked it out. There was indeed a Saxon cross in the churchyard, from the early days of Christianity in the region. The cross has pagan as well as christian motifs carved on it. Interesting as that was, I discovered inside the church some curious brackets that supported the hinged seats of the pews. They were carved out of oak by a master carver. Each carving was totally unique with quirky and inventive details. Definitely not run of the mill stuff. With the help of the guide book and a few things in the church we learned that the carver's name was Grinling Gibbons. Very little is known about him, but he was one of the many journeymen/craftsmen that travelled around Europe in the middle ages, creating works of art that can still leave us in awe at their incredible skills and sheer artistic ability. 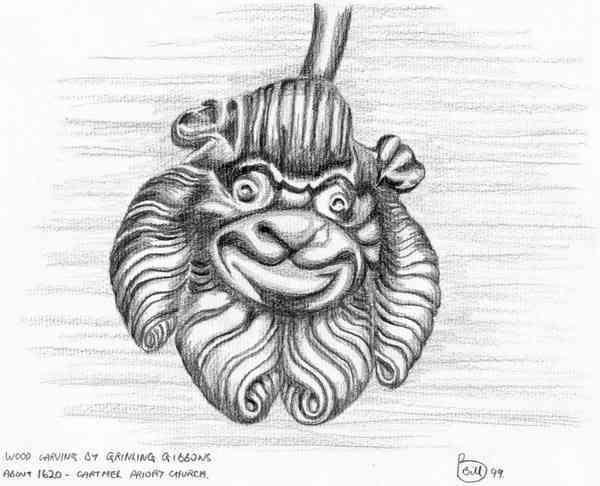 I get the impression when looking at this sketch which is a bit laboured, that old Grinling knocked off the actual carving quicker than it took me to do the sketch. The original photo that I copied when drawing the sketch. 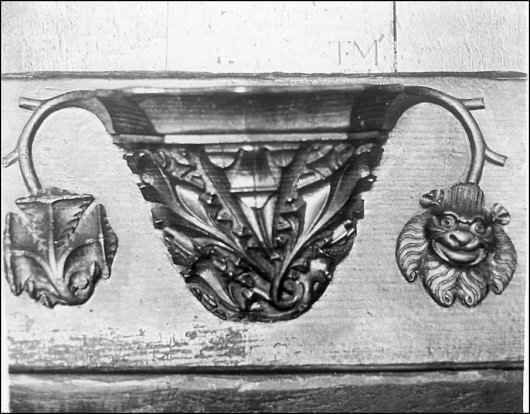 If the word misericord has got you stumped, it describes a sort of shelf bracket that could be used to lean or partly sit on to relieve the misery of standing long hours during church services.